Hello, all! 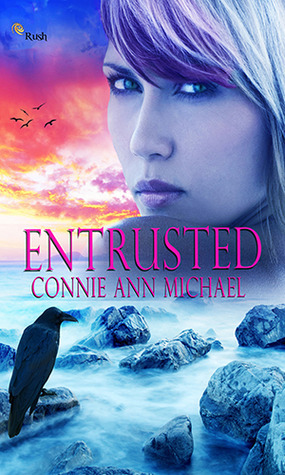 Welcome to my stop on the blog tour for Entrusted by Connie Ann Michael! I have all kinds of goodies for you today--an excerpt, interview, and giveaway! Of course, I'll also tell you all about the book and author. Be sure to check it out! In the form of a tweet, how would you describe Entrusted? A girl who discovers the heart of a rouge spirit was hidden in her and a boy who is sent to protect her when the spirit returns for his heart. What are five fun facts about your novel? -It takes place in a real place, descriptions are accurate and you could follow the map of the book if you visited. -Although altered a bit the legend is true. -Skinwalkers are a topic not to be discussed with the Native Americans. -I actually met the inspiration for Solomon at a hotel on the Navajo Nation. Why did you decide to use Native American legends in Entrusted, and how do you use them? That is how the story came to me. It evolved in my head and the next thing I knew the characters were telling me their story and they told me who they were. I know it makes me sound crazy but it happened that way. According to the synopsis, Emma, your main character , "finds herself in the middle of a battle for a heart holding great powers - A heart hidden with within her." Is the battle for her actual heart? Would you mind elaborating on this? Yes it is the physical as well as the metaphorical powers held within. She will die if it is taken. Using the letters of ENTRUSTED, how would you describe yourself? John Smith or John Rolfe? Favorite book/movie with Native American ties/inspiration? Dances with Wolves hands down. Oh crows for sure! I wear a raven charm. They scare the crap out of me after the attack but I believe it is my talisman.